A weekly newspaper put together a unique front page featuring women who took part in the #nomakeupselfie Facebook campaign. North Devon Gazette reporter Sarah Howells said she was “inspired” by the number of selfies appearing on her FB newsfeed and came up with the idea of collating them for a story. After Sarah contacted each of the women individually for permission to use the photographs, editor Andy Keeble laid them out in a photo-montage. The result was a unique, headline-less front page which turned onto a page three story giving some of the human stories behind the pictures. The stories behind the pictures ranged from those posting in memory of a loved one, to women who had been through cancer themselves. To compliment their print coverage, the Gazette also featured an online gallery with each individual photograph and the owner’s reasons behind posting the selfie. The campaign, which has featured widely in the national media, has seen more than £8m raised for Cancer Research UK in just six days. The North Devon Gazette is the best free weekly I have encountered in many years observing papers up and down the country. It consistently trounces the opposition in print and online and this is just another example of the Editor and his team’s innovative, fresh take on journalism. I wonder if Sage Sub works at The Gazette? 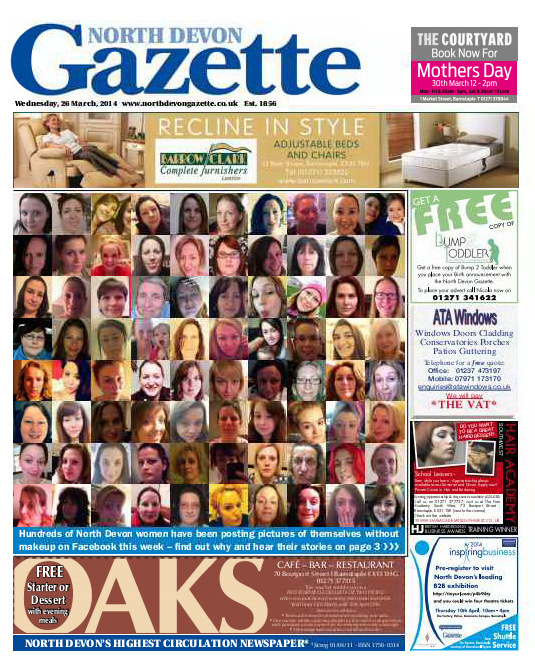 The Gazette is far from the best free weekly in the country – it’s the same as almost every other weak offering from Archant. Its templated pages are littered with 200 word nibs, copied and pasted press releases and non-stories. Its letters page is filled with drivel (a reflection of the fact its editor is forced to print every offering from its below average intellect readership ) and it offers no insight whatsoever on any subject. I can’t think of a single occasion in the past two years where the paper has offered a fact file, vox-pop, chart or table alongside a story. As far as trouncing the opposition goes, that’s fantasy. While the North Devon Journal has declined significantly in the past year or so and only seems interested in “good news stories” its still ahead of the Gazette – despite a 10 per cent price hike. Sure, The Journal only invests serious time in following up stories sent out from the Local World Transformation team, and desperately trying to make them fit in an area which is so unlike most of LWs papers patches, but The Gazette doesn’t offer any proper journalism either. While under its current editor The Journal shies away from any potentially controversial stories, the same can be said of The Gazette – which paints a sad picture for North Devon, with neither of the local papers holding council, police or any other body to account. Take this article for example – are we really holding up the fact that a reporter has copied and pasted 80 pictures from Facebook to the front page of a free weekly as an example of exceptional journalism? In response to the above, I’ve got no idea who Sage Sub is but as editor, I can vouch that he/she definitely doesn’t work at the North Devon Gazette. While press releases do have some place in our newspaper (as they do most newspapers), they form only a very small percentage of our weekly output, which I would argue is interesting and original. I would also argue that we run a lively letters section, so much so that we have actually doubled its size in the last 12 months to give more readers the chance of having a letter published. And I’m not going to harp on about holding councils etc to account – any regular reader of the Gazette will know that we regularly have lots of fun doing so. The Facebook ‘selfies’ front was actually a welcome bit of light relief for us following a months of harder stuff. I agree it’s not exactly ‘exceptional’ journalism – but it’s a nice way to show local people doing something interesting for a cause they feel passionate about – surely something to be celebrated in a local newspaper, and why not on the front page? It might not be the best front page story in the world but visually it’s quite effective. Sadly it’s something which would be impossible to produce using Newsquest’s Knowledge system.